The earliest recorded object is a Lower Palaeolithic handaxe (NHER 7241), and the earliest recorded monument is a prehistoric burnt mound (NHER 30875) just south of the village, which contained an area of blackened soil and potboiler flints, as well as a very interesting and rare example of a miniature Neolithic flint axehead. Another burnt mound has also been noted in the very south of the parish, this time associated with a normal sized axehead (NHER 30600). Other early objects include prehistoric flint (NHER 7174 and 34442), and a Neolithic partly polished flint axehead (NHER 7240). 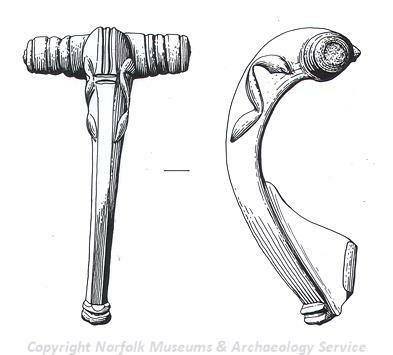 Bronze Age objects are limited to a spearhead fragment (NHER 30600) and a possible plano-convex flint knife (NHER 30660). However an Iron Age pit and pottery sherds have been recorded (NHER 30660), as well as an Iceni gold stater coin (NHER 30875) and Iron Age brooch fragment and coin (NHER 30600). Indeed, a large number of Roman objects were also recovered from the site of these last two objects, which has led to the conclusion that this represents a Roman settlement (NHER 30600). Roman coins, furniture and strap fittings, and personal and dress ornaments have all been recovered here, as well as objects from the Saxon periods. These include a number of Middle Saxon sceattas, which has resulted in the idea that this site continued to be in use into the Middle Saxon period. Apart from the two possible Saxon period settlements already noted, there are no other confirmed Saxon period monuments, but pottery sherds have been noted (NHER 7173 and 7174), as well as an Early Saxon brooch (NHER 40985), and a Late Saxon strap fitting (NHER 7241). It is possible that the parish church of St Margaret (NHER 7184) may retain stone quoins of the Late Saxon or early Norman period, but the parish is mentioned only briefly in the Domesday Book and no church is listed. The church (NHER 7184) building itself is small, with both the chancel and west tower in the Early English style and largely untouched. The nave has been modified and has three large, square late Perpendicular windows on each side, and the east window does in fact date to 1864, despite being convincingly Early English in style. Although Stanfield does not have a surviving medieval manorial site, there were until recently the remains of a medieval moated site (NHER 7180) visible in arable land almost directly opposite the church. However modern farming has largely destroyed and in-filled this feature, and it is not now thought to be visible. Other medieval monuments are limited to pits (NHER 7171 and 38132) and a possible parish and field boundary (NHER 7276). Medieval objects have been reasonably common finds across the parish, including pottery sherds (NHER 7171 and 34442), building materials, (NHER 34113 and 34114), and coins (NHER 40985 and 41897). Similar finds from the post medieval period have also been recovered. Other finds dated to the medieval period are a small number of more personal objects, which include seal matrices (NHER 13191 and 32167), a silver finger ring (NHER 7241), a ring brooch (NHER 30703), a gilded roundel (NHER 31249), and an enamelled and inscribed roundel depicting a pelican (NHER 41105). Post medieval buildings of particular architectural interest are unfortunately sparse, however Glebe Farm (NHER 20597) incorporates an unusual fireplace and other features from the 16th and 17th centuries, including beams from a demolished barn that are dated to 1651. World War Two also left its mark on the parish, with a single pillbox (NHER 5765) still visible in a field on the northern side of Tittleshall Road.